If you click on any sprite in the editor and press ALT-ENTER, you'll get a dialog box that look like this. 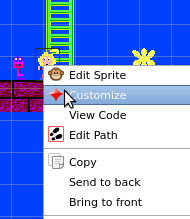 You can also get there through the menus, by selecting the top level Sprite sub-item Customize. 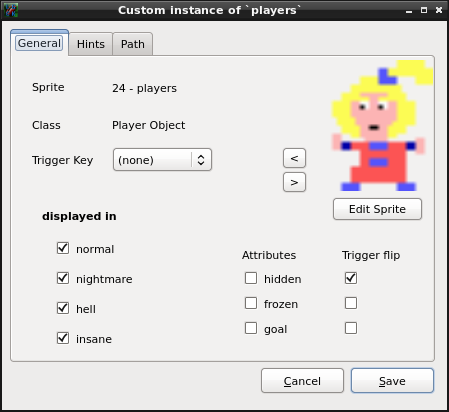 You can even right-click on any sprite and select Customize. This key is a number which ties two or more sprites together. One is the trigger, the others are receptacles. Both have the same trigger key number (in the example above, this number is 1). A trigger can be a switch ( like the one the right -- Z-Key Trigger). It can also be a diamond, that player picks up ( -- Pickup Trigger). Once the trigger is initiated, a resulting action performed (hide, frozen or goal). This is called the trigger flip. Objects that are hidden cannot be seen or interacted with. Objects that are frozen cannot move. Their animation stops. They still offer limited interaction. Goal objects must be eliminated in order to complete the level. How this is achieve depends on the nature of those Sprites. For example, a gold bar needs only to walked on to be removed. Monster have to be killed. Energy fields have to be disabled. If the "trigger flip" box is checked next to hidden, frozen and goal. The corresponding attribute will be toggled when trigger is called. If an object is hidden (hidden checked) and the flip is also checked. This is object will become visible. By default, the flip for hidden is always checked on all foreground objects.